As much as we wish we could, there are not enough hours in the day and members of our staff to be able to greet visitors personally and provide them with the information they need to have a great Raleigh area experience. So many years ago, the Bureau developed a Tourism Ambassador program, a corps of volunteers who help man the official Visitor Information Center, provide manpower at events and many other valuable services. We couldn&apos;t do what we do without them. Here, GRCVB&apos;s director of services Julie Brakenbury, CGSP®, whose department oversees the program, answers a few questions about our ambassadors. Q: What is the Tourism Ambassador program? 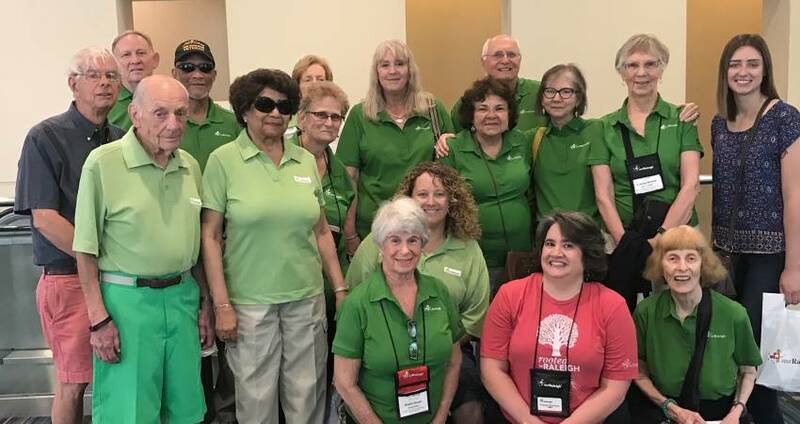 A: "GRCVB&apos;s Tourism Ambassador program is a group of volunteers, all passionate about Raleigh, N.C., who want to share their love of our area with visitors." Q: Where can they be found? A: "You&apos;ll find ambassadors working in our Visitor Information Center (VIC), at the welcome kiosk at the Raleigh Convention Center (RCC) and on-site at event locations (festivals, meetings, conventions, sports events) and hotels all around Wake County." Q: How much do they make? A: "Ambassadors are unpaid and give generously of their time for this work." A: "Their work shifts are normally three to four hours at a time. We ask that they work a minimum of two shifts per calendar year, though many give much more time than that!" Q: What does an assignment look like? A: "If an ambassador is in our VIC, he or she typically is working the information desk answering questions from walk-in visitors or fielding questions by phone. The questions can range from "where&apos;s the museum?" or "what restaurants are close by?" to "what is there to see and do in Wake Forest?" (or any other of the municipalities in Wake County). "If an ambassador works at the RCC or onsite at an event, he or she is often at a welcome kiosk or information table. The questions at events are similar to those that they get in the VIC, although many questions can be about the specific event (in those cases, our full-time staff provides background information so ambassadors are well-prepared). "Some of them like to volunteer for registration assistance or wayfinding. The needs for these volunteer opportunities can vary based upon the unique needs of the event." Q: What have been the benefits of the program over the years? A: "The benefits of the program are many. "For the visitor, a big benefit is that ambassadors are authentic and genuine, they talk about what they love and the enthusiasm they exude often becomes contagious. They engage a visitor in a different way than the official tourism website or print materials can. People like to visit what they hear others like! "For the destination, a face-to-face interaction with an ambassador is a way to educate the visitor about the variety of things there are to see and do here. That likely results in a visitor spending more time in the destination (and more time often means spending more money while they are here)! "We often hear stories about how ambassadors have impacted the destination by just talking about what they know about Raleigh. This often helps us grow leisure visitor impact by attracting visiting friends and relatives or helps us recruit future meetings, conventions and events, because they have talked about Raleigh in their local spheres of influence and involvement in area organizations. "There is also a positive impact to the ambassadors themselves; they grow their networking circles by meeting other ambassadors while working events, they learn more about the area by serving as an ambassador and they go out to experience the area as a result of what they have learned. They also participate in some fun activities (we include them on See for Yourself Tours and Ambassador Training Days)." Q: What are the qualifications to become an ambassador? A: "The qualifications to be an ambassador are to have lived in Wake County for over a year, to have a base knowledge of the area, to like and enjoy being with people and have some time available to volunteer. Typically an ambassador candidate has high regard for customer service. "Anyone interested in becoming an ambassador should contact Kessa Stevens, CGSP®, VIC manager and manager of the Tourism Ambassador program. Kessa will set up a time to meet with you so you can learn more details and how to get started." Q: What do ambassadors say about the program? A: "Ambassadors are a diverse group of people, some retired professionals, some working paid jobs and some students. They come from all walks of life, all backgrounds, but are alike in that they love people, have explored and like to explore Raleigh/Wake County and know what there is to see and do here. They make our destination a better place by instilling their enthusiasm for Raleigh in the work they do for us. "Tourism ambassadors are often the front line of hospitality to make visitors feel welcome and plant seeds of interest to help them want to come back."